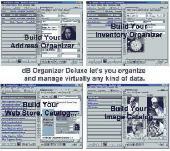 PCWin Note: dB Organizer Deluxe 3.9 download version indexed from servers all over the world. There are inherent dangers in the use of any software available for download on the Internet. PCWin free download center makes no representations as to the content of dB Organizer Deluxe version/build 3.9 is accurate, complete, virus free or do not infringe the rights of any third party. PCWin has not developed this software dB Organizer Deluxe and in no way responsible for the use of the software and any damage done to your systems. You are solely responsible for adequate protection and backup of the data and equipment used in connection with using software dB Organizer Deluxe. All-in-1 Personal Information Manager - All-in-1 Personal Information Manager is a personal organizer useful for managing any kind of personal information such as tasks, events, contacts, notes, file links, Web links and executable key scripts. My Information Manager - Developed for those who need an info manager, planner or a business server to watch over their business transactions, upcoming events and personal information. This powerful database program will keep your data warehoused, sorted and ready to use at. TreePad PLUS - All in one! Versatile tree-structured Personal Information Manager, database, search engine, word processor, Website generator and more. Store all your notes, letters, emails, texts, hyperlinks and keep them organized, always just a few clicks away. EfficientPIM Free - EfficientPIM Free is a cross-platform personal information manager. Use it to keep track of contact, tasks, appointments, to-do lists, birthdays, and more including keeping note, diary, and password. And you can sync data across PCs and mobile phone. EfficientPIM Free Portable - EfficientPIM Free is a cross-platform personal information manager. Use it to keep track of contacts, tasks, appointments, to-do lists, birthdays, and more included keeping note, diary, and password. And you can sync data across PCs and mobile phone. EfficientPIM Portable - EfficientPIM is a cross-platform personal information manager. Use it to keep track of contacts, tasks, appointments, to-do lists, birthdays, and more including keeping notes, diaries, and password. And you can sync data across PCs and mobile phones.